I had been using Twitter for a while but I never experienced the true power of this social media platform. 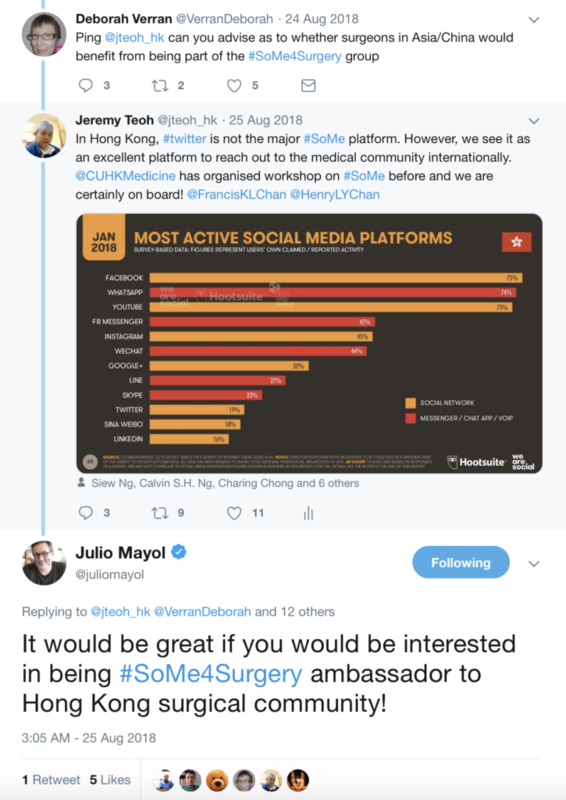 It was a cold call from @VerranDeborah and @juliomayol when I started to notice the hashtag #SoMe4Surgery. I was pleasantly surprised and impressed by the active engagement of the #SoMe4Surgery participants. After participating in a #SoMe4Surgery live conversation event on #surgicalinfection, I finally realized the potential impact of a simple hashtag. While I was amazed by how #SoMe4Surgery brought the surgical community together, many of the topics being discussed were not entirely relevant or specific to a urologist per se. 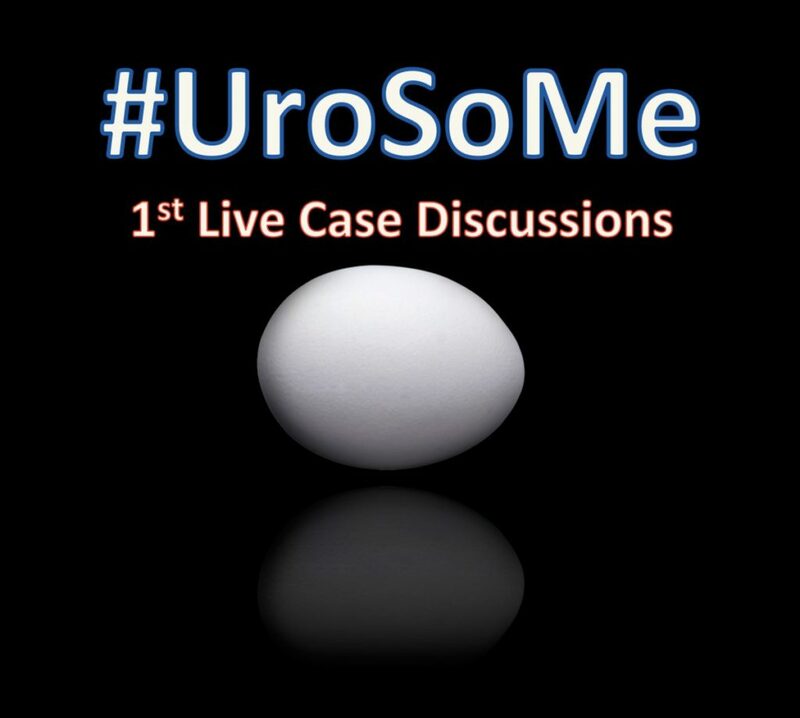 I felt the need of a hashtag specific to Urology, and I quickly started to conceptualize and plan ahead in building up the #UroSoMe community. The #UroSoMe twitter account was officially registered in August 2018. 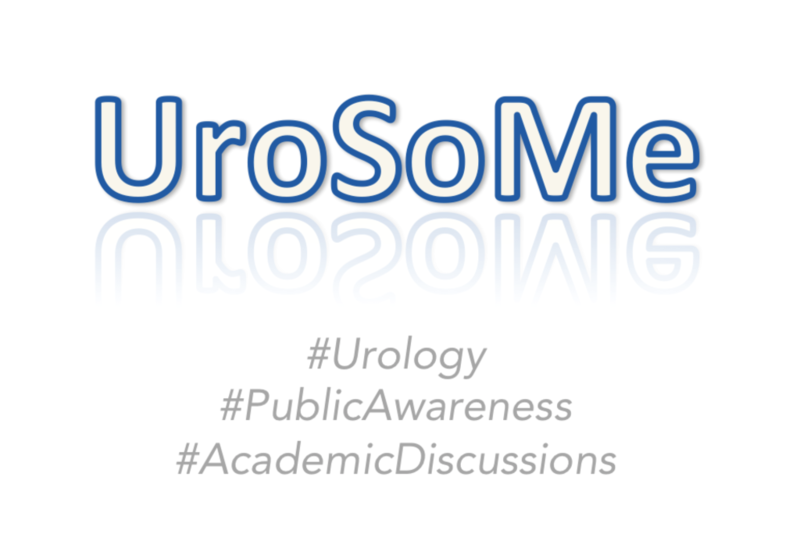 #UroSoMe stands for ‘Urology Social Media’. My initial thought about #UroSoMe was simple. I wanted to develop a hashtag specific to urology. I wanted to increase public awareness about different urological conditions. Most importantly, I wanted to bring the urology community closer together through this social media platform. I believe there is so much for us to learn from each other, and such interactions should never be bounded by physical or geographical restrictions. Coincidentally, I was invited to talk about social media at the 27th Malaysian Urological Conference 2018, and I decided to take this opportunity to introduce #UroSoMe to the urology community. The initial response from the audience was promising. Even after the meeting, many urologists came to me for in-depth discussions about the opportunities and applications of social media in urology. I felt that #UroSoMe might really work and it was time to gather more people to establish the community. The first invitation sent in on 14 December 2018, which I often regard as the ‘start date’ of the #UroSoMe community. 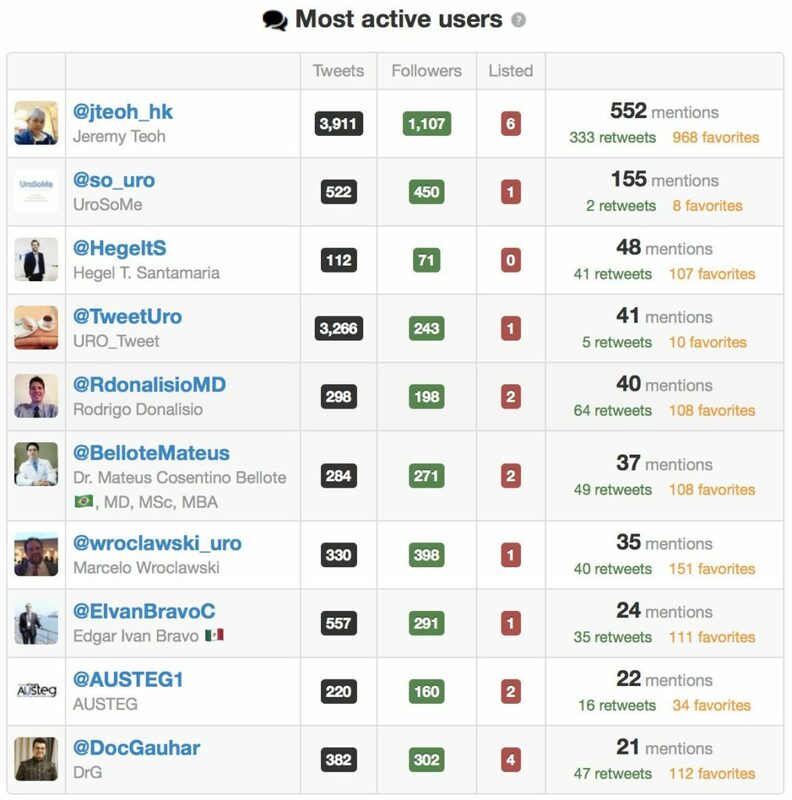 By inviting and encouraging people around to use a common hashtag, the #UroSoMe community keeps growing. With increasing momentum, the first #LiveCaseDiscussions was planned. It was a pre-planned event for urologists to get ‘online’ and discuss about some posted cases. A polling had been held in advance, and the topic to be discussed was chosen to be ‘Stone’. The #LiveCaseDiscussions was on air at 4pm (CET) on 5 January 2019. A total of 9 cases had been presented and discussed. Hosting this event was overwhelming with vigorous discussions among the participants. It took approximately 2 hours to ‘complete’ the event, but the conversations went on for the next few days. Special thanks must be given to the most active users. #UroSoMe and the first #LiveCaseDiscussions would never be successful without their tremendous support. The immediate effect of the #UroSoMe #LiveCaseDiscussions event was overwhelming. 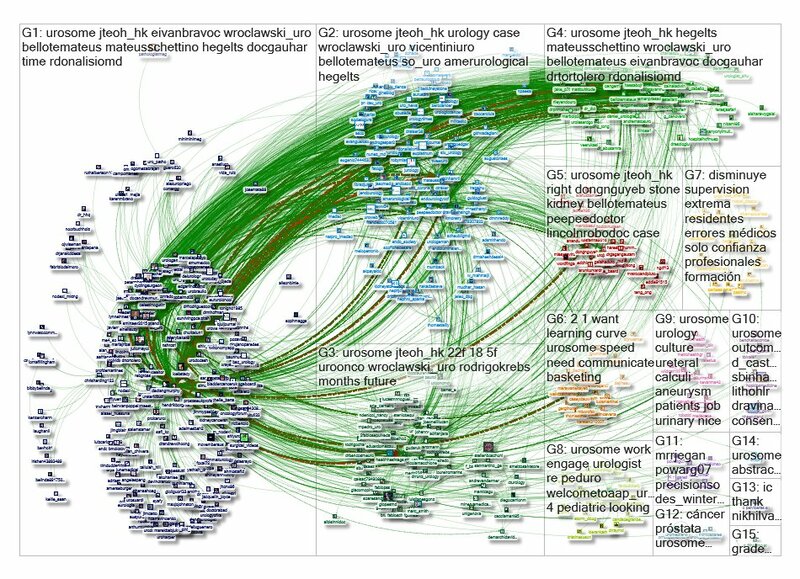 This graph represents a network of 515 twitter users whose tweets contained the hashtag #UroSoMe. 6692 mentions, 1044 retweets and 617 replies were recorded within a 10-day period from 27 December 2018 to 6 January 2019. From a social science point of view, this picture represents a ‘tight crowd’, in which discussions are characterized by highly interconnected people with few isolated participants. I guess this is exactly how we feel about the urology community! hopefully, at #EAU19 and #AUA19 as well! P.S. I must thank @juliomayol for the inspiration of #UroSoMe, @gmacscotland for his teaching on social media analytics, and @marc_smith for his support in NodeXL. Jeremy Teoh (@jteoh_hk) is a Urologist based in Hong Kong, China. @jteoh_hk, @adelmesbah2, @BelloteMateus, @DocGauhar, @DrTortolero, @D_Castellani, @EdgarLindenMD, @EIvanBravoC, @HegeltS, @JontxuM, @gudaruk, @MarcelaPelayo, @RdonalisioMD, @Urologeman, @wroclawski_uro and @zainaladwin. Generally I was not much to use twitter until I began to see the amount of information the accessibility of medical knowledge so extensive and the great possibilities of connection just a few words of distance with an impressive connectivity capacity that joins enthusiastic professionals with multiple ideas but with the same goal to seek the resolution of the disease to our patients! Thank you BJUI for the opportunity to publish this blog about the beginning of #UroSoMe. I believe this is only the beginning and we have so much more to explore in the future!